Property Owners: List your Corsica property on the premier site specialising in French holiday lets. More Info. View villas and gites in Corsica. Finding accommodation is no problem as there are plenty of comfortable Corsica villas to choose from. An alternative option is to have a gite holiday. Gites in Corsica make excellent bases for the most enjoyable of stays, enabling you to experience the Corsican lifestyle as you set about the serious business of relaxing and having fun. 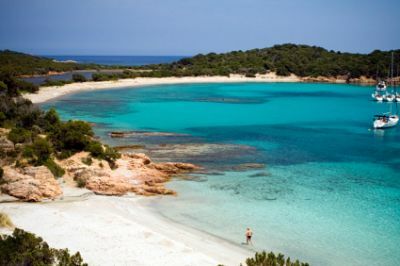 Corsica is home to a countless number of beautiful clean beaches, all around the island. It’s very much a question of taking your pick, because whichever one you choose, you won’t be disappointed. While there are some more commercial beaches, there are also plenty of little bays and coves tucked away, off the beaten track, so it pays to do some exploring. For the energetic, the island is an absolute paradise. Sporting opportunities abound everywhere, from sea sports, like diving, wind surfing and water skiing, to mountain activities, such as canyoning, kayaking, rafting and rock climbing, and adventure sports such as abseiling, bungee jumping and paragliding. And if that all makes you feel rather tired, there are always more gentle forms of exercise to be found in golf, fishing and horse riding. Despite its relatively small size, Corsica has more than enough to keep its visitors occupied. Be sure to make time for a boat trip in and around the Scandola Nature Reserve, an area of sheer natural beauty that will take your breath away, while on another occasion, venture to Ponte Leccia, in the mountains, for a ride on the narrow-gauge railway, and treat yourself to some spectacular vistas. For something completely different, how about donkey walking in Olmi-Cappella? You hire a donkey for the day to carry your picnic and other paraphernalia as you set about having a long, lazy walk in the countryside, or down by one of the rivers. Corsican cuisine is greatly influenced by the varied geography and ecology of the island. Seafood and freshwater fish are readily available, and wild boar and other game are very popular. Corsican pork is plentiful and is the basis of many a delicatessen offering. Also, look out for cheeses made from the milk of goats or sheep; casgiu merzu, casgiu veghju and brocciu are all delicious and a good starting point. As for something to drink, Corsica produces its own wines. Both white and red are more than acceptable, as is Muscat wine, which can be bought still or sparkling. If you prefer something a little longer, a chilled glass of Pietra, the local beer made from chestnut flour, is very welcome on a hot day. It has a strong flavour that is slightly sour, while maintaining a delicate softness. Finally, don’t miss out on the aperitifs. Corsica produces quite a few, all high quality. Cedratine, made from the Cedrat lemon, which is not often found anywhere other than on the island, is a good example, as are Casanis and Vin d’Orange.